How appropriate that your wonderful literary skill was involved in your first horse ownership. I entered essay contests but never won one; maybe the motivation just wasn’t strong enough … things like savings bonds and such. A horse? Wow, that might have made a difference, but I’m afraid the big difference is you were a better writer!! I know this is about horses – but I just love hearing stories about your childhood. It seems you had a very joyous one. What a dream come true! I only imagined the dream and you lived it! How wonderful! I can only imagine how happy it all made you. You go girl! That mane is awesome. 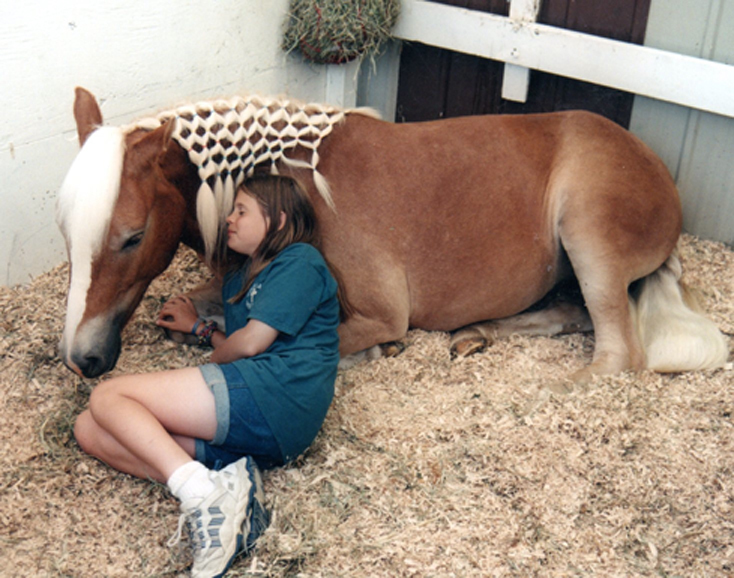 I’m SO going to do my cob’s great big mane in that style! What a wonderful story! When I was eight, my dad rode a horse into our yard on Christmas day! (What did every child want for Christmas in those days?!) I love it when these kinds of things happen . . .
With a nod to Prankster, and the rest of the golden horses, it is a life well-lived. A day to celebrate for sure. What a heart warming story Emily, it touched my heart and soul. Thanks for sharing dreams come true outside of Disneyland! Thank you for sharing this story. I also had the same, deep horse dream, but life took me in other directions. It’s fun living vicariously through you! The Haflingers, a breed I was unfamiliar with until your blog, are just beautiful. Emily, you not only won a horse–you win our hearts with your stories. This story is special–not many bring back my own childhood dreams. Thank you.